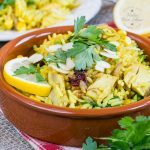 This leftover roast turkey biryani is a quick, easy and delicious one pot meal for all the family to enjoy after Christmas or Thanksgiving to use up the leftover roast turkey. Recipe includes instructions for Instant Pot or Electric Pressure Cooker and detailed notes on ingredient substitutions and additions as well as WeightWatchers Points. 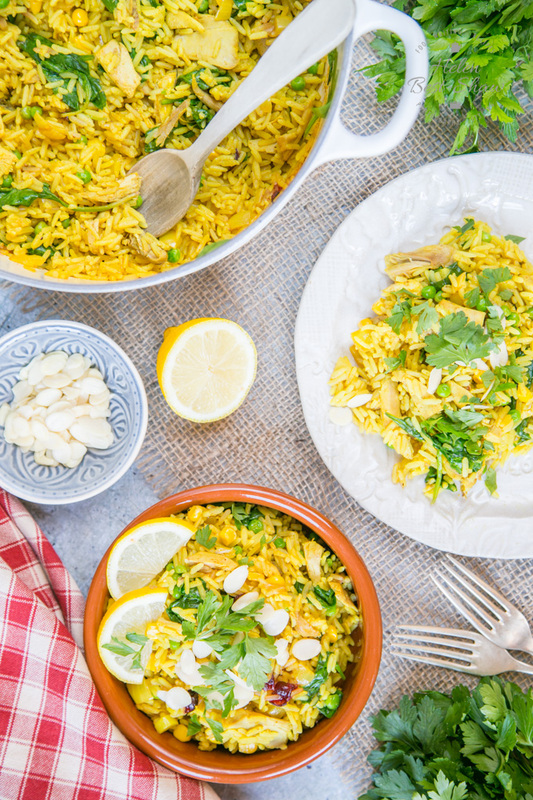 Can I Freeze Leftover Roast Turkey Biryani? I’m always keen to make the most of leftovers, and Christmas and Thanksgiving means a leftover bonanza. 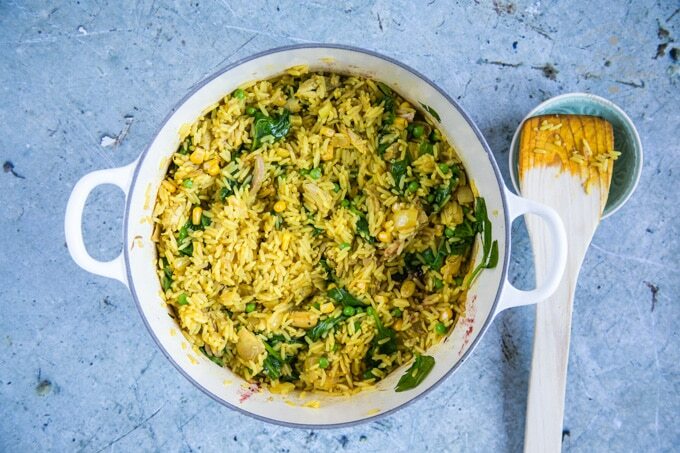 This recipe for leftover roast turkey biryani is simple, tasty and adaptable: just adjust the spicing to your preference. A traditional biryrani will have layers of rice and meat, this dish mixes everything together, but is no less delicious. You can make your own stock, or use good quality ready made, pot or cube. 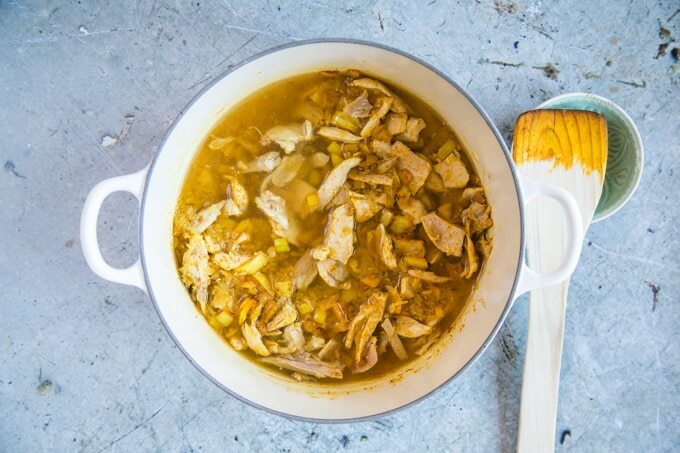 If you make your own stock (easy, thrifty and highly recommended), then you can make the stock using the turkey carcass, to really eke out every morsel of flavour from the bird. I first made this recipe (and prefer it with) basmati rice, but any long-grain rice will also work. You could also use brown rice, but you would need to adjust cooking times. Recipe was photographed using long grain rice. 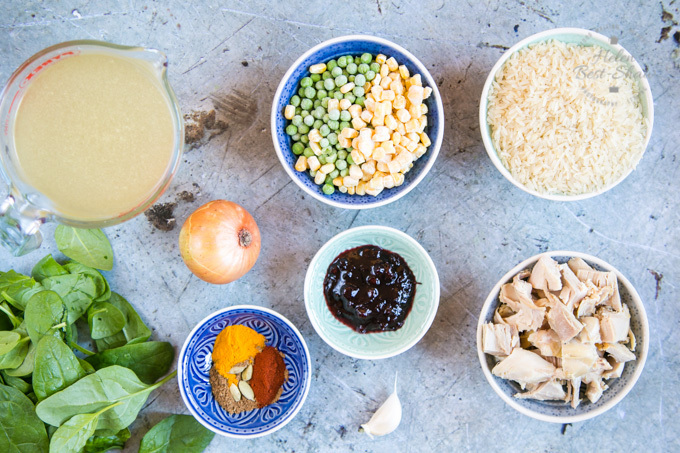 Step 1 – measure out all the ingredients. I find a few moments organizing at the start of any cooking pays dividends later: I’m much less likely to leave something out, or use the wrong quantity, if it’s sitting in a small bowl in front of me. Heat your oven to 180C / 350F / GM4. 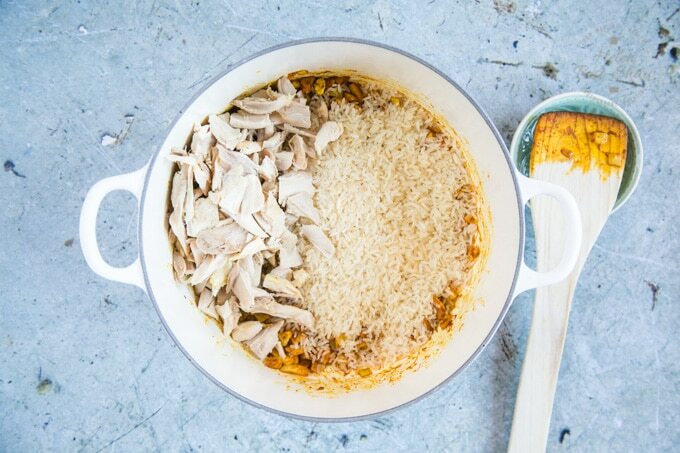 Step 2 – Heat a large casserole dish on the stove top over a medium heat, and add the oil. Chop the onion, and fry until it starts to turn translucent, stirring frequently. Crush the garlic and add it to the onion, along with the spices. If you are using fresh chicken or turkey instead of cooked leftovers add it and fry the same time as the onion. 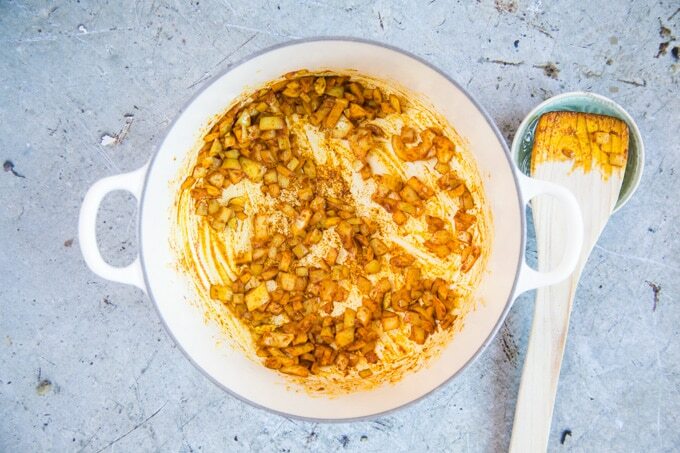 Step 3 – Stir the spices in, and cook until they start to release those delicious aromas. Step 4 – Add the rice and turkey, and mix well to coat the rice and turkey in the spice mixture. Step 5 – Add the stock, stir, bring to a simmer, then cover and cook in the oven for 25 minutes or until the rice has absorbed the liquid. Whilst it is cooking put the peas and corn in a bowl and cover with boiling water to defrost them. 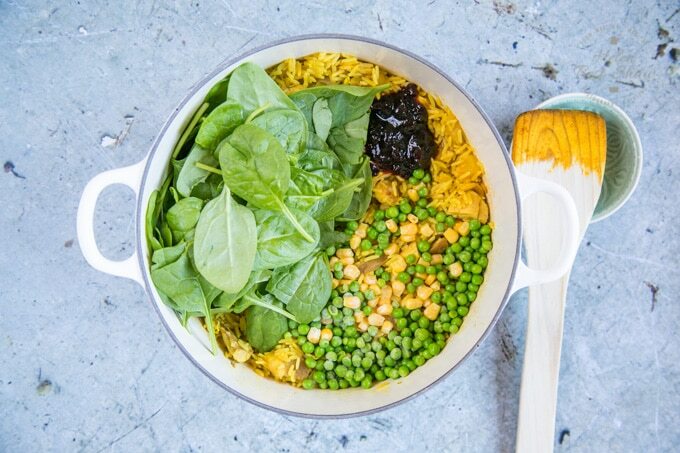 Step 6 – Drain the peas and corn and add to the pot along with the spinach and cranberry sauce, stir well and return to the oven to cook for a further 5 minutes. Step 7 – It’s ready to serve! Garnish with some fresh herbs, a wedge of lemon and some almond flakes and enjoy! Garnishes – Again use what you have, I love fresh coriander (cilantro) but any fresh herbs are delicious. 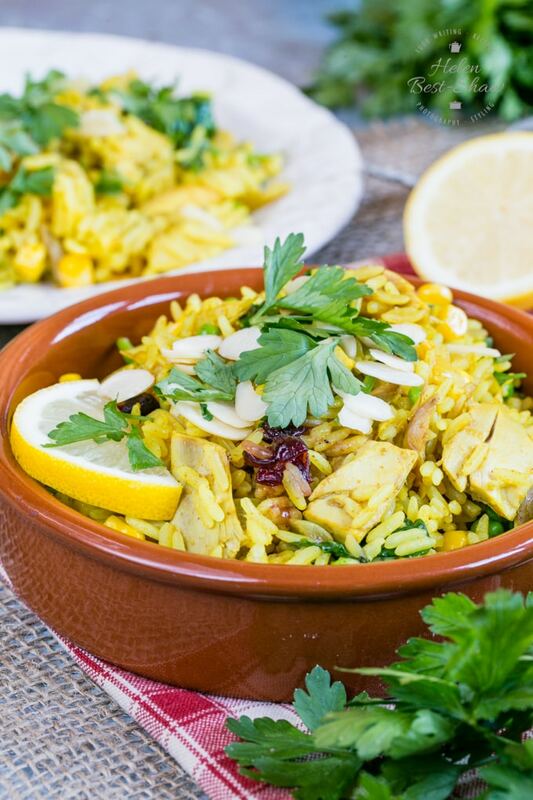 Garnish with toasted flaked almonds, cashews or pine nuts for some texture and crunch. Absolutely, yes this dish is perfect for the Instant Pot or any other electric pressure cooker! 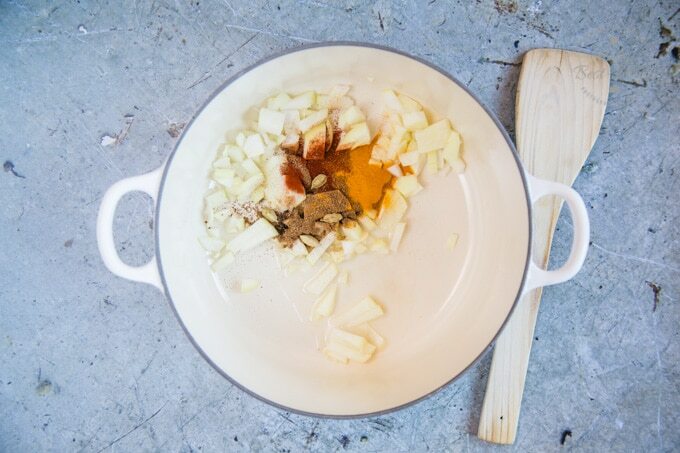 Use the sauté function to cook the onion, garlic and spice as above. Absolutely. I pack into plastic takeout trays and freeze then microwave from frozen. Remember to freeze as soon as the dish has cooled. If you try this Leftover Roast Turkey Briyani Recipe please tag #FussFreeFlavours on Instagram or Twitter. It is amazing for me when for me when you make one of my recipes and I really do love to see them. You can also share it on my Facebook page. Please pin this recipe to Pinterest too! Thanks for reading Fuss Free Flavours!